Hired by Carl Hallman, the desperate-eyed junkie scion of an obscenely wealthy political dynasty, detective Lew Archer investigates the suspicious deaths of his parents, Senator Hallman and his wife Alicia. Arriving in the sleepy town of Purissima, Archer discovers that orange groves may be where the Hallmans made their mint, but they've has been investing heavily in political intimidation and police brutality to shore up their rancid wealth. However, after years of dastardly double-crossing and low down dirty-dealing, the family seem to be on the receiving end of a karmic death-blow. 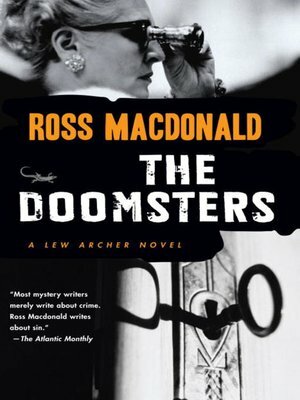 With two dead already and another consigned to the nuthouse, Archer races to crack the secret before another Hallman lands on the slab.Murder, madness and greed grace The Doomsters, where a tony façade masks the rot and corruption within.